Many appraisers don’t know about or don’t understand the new FDIC and “regulatory agency” exclusions found in many appraiser E&O policies. Why is it relevant to know if your policy has an FDIC or regulatory agency exclusion of some sort? The main reason is because the FDIC sues appraisers for professional negligence — such lawsuits are discussed in prior posts: here and here. How do you determine if a policy being offered to you contains an FDIC exclusion? 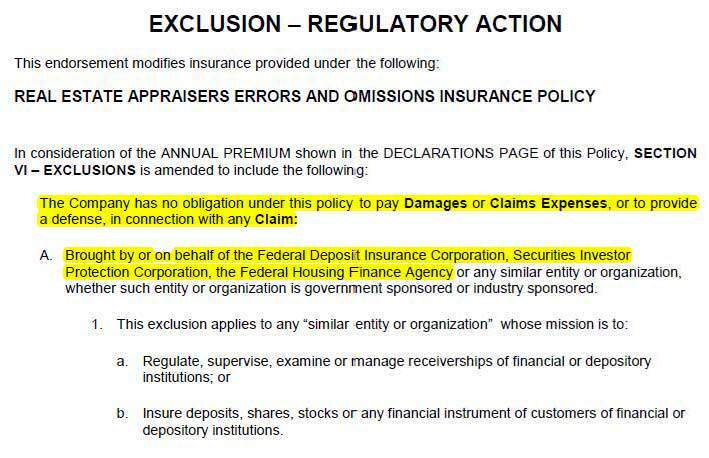 First, no policy sold by LIA in its appraiser E&O program contains any FDIC or similar regulatory agency exclusion. If you are not purchasing E&O insurance in LIA’s program, what you need to look for are the common exclusions shown below. When they apply to a policy, these exclusions are usually added as endorsements, typically at the end of an appraiser’s policy. The following exclusion is applied as an endorsement to many appraiser E&O policies issued by Navigators in states where appraisers are at higher risk for being sued by the FDIC. 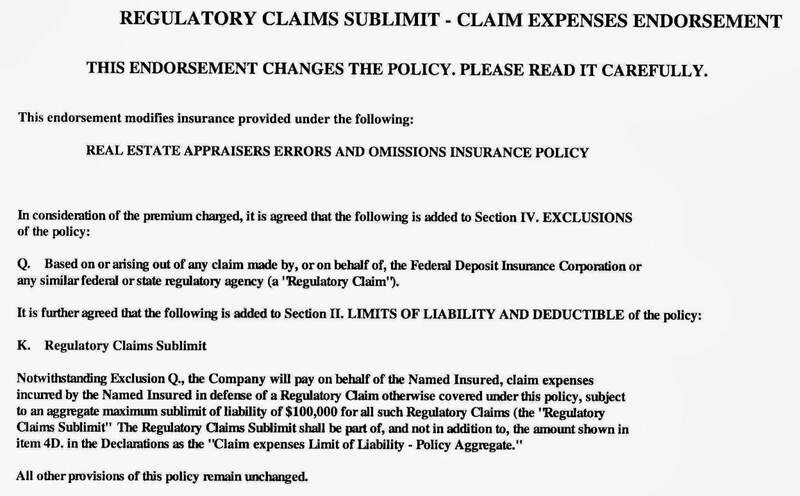 The effect of the endorsement is to exclude coverage for damages in any claim by the FDIC or by any similar federal or state regulatory agency and to cap the attorneys’ fees available to defend such a claim. Oh boy, I’m going to have to call Landy up. If they’re denying the most important faction of coverage, I’m going to drop them and go with LIA. Perhaps I’ll look closer at the new state policy, but that new group policy is only 300/600, and most lenders want the 500/1m. CRES…! 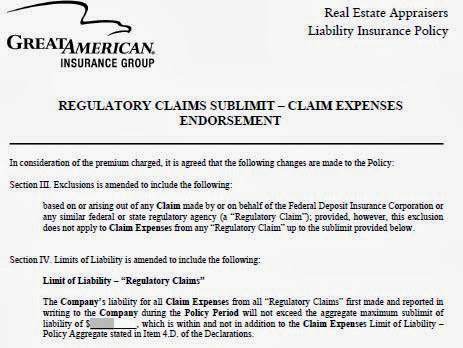 $310 all coverage!…FDIC priors…. $1million coverage!!! Next story Will the Madness Ever Stop?? ?